Tired of of the same old marshmallows? This recipe, inspired by A la Mère de Famille‘s own recipe, allows you to do whatever you want with them. The flavour options are endless…to infinity and beyond! 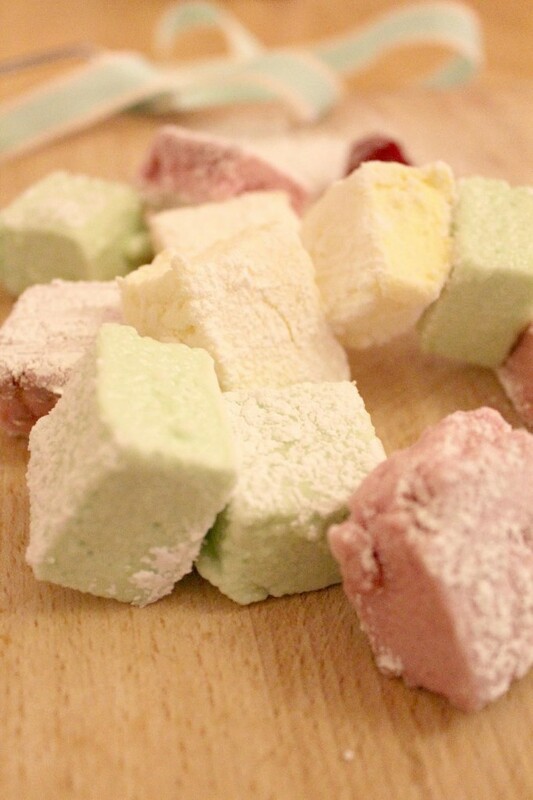 Fruity marshmallows are fairly straightforward to make but you’ll need a sugar thermometer. The flavours in the pictures are passion fruit, lime and raspberry – my own hat-trick. If using gelatine sheets, let them soak for 5 minutes in cold water before draining and patting dry, making sure all the excess water has been removed. In a saucepan, heat together the pulp/coulis, water, honey, sugar and gelatine and heat the mixture on a medium-high hob to 114°C. Meanwhile, whisk the egg whites until they become foamy. Add the pulp mixture to the eggs and continue whisking until the marshmallow rises. Add the colouring if using. Let the marshmallow mixture cool down to 40°C. Dust a 20 x 20 cm tin with a little icing sugar and starch flour. 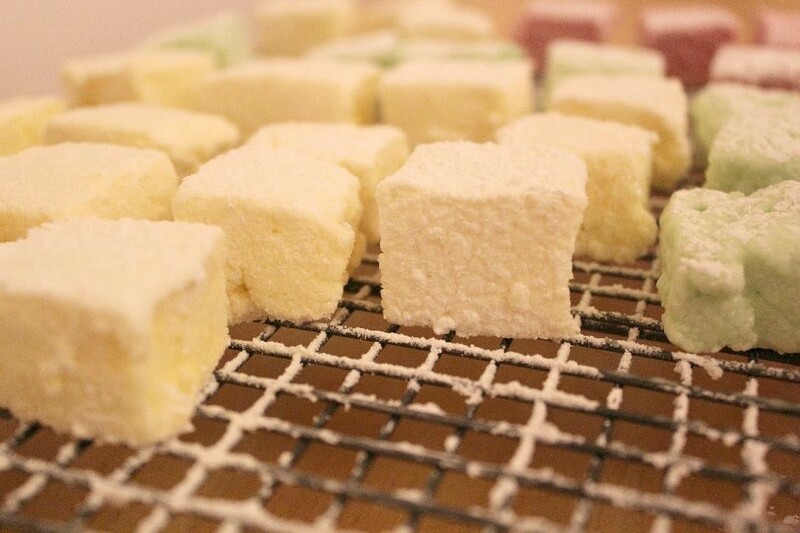 Pour in your marshmallow and let it cool completely at room temperature for at least 3 hours before cutting into 3 x 3 cm squares. 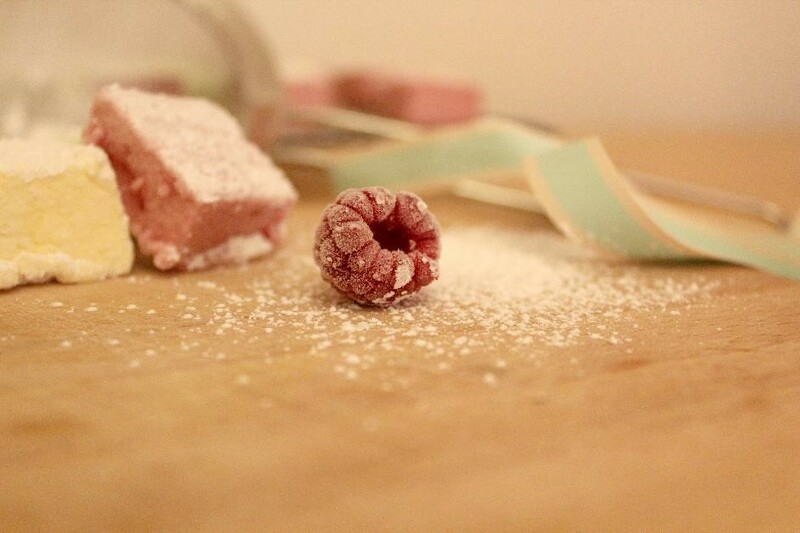 Dust them with the remaining icing sugar and starch flour so that they do not stick.